Sanitisers that don't need to be washed off after use. Recommended for use in restaurants, dairies, food processing plants and bars. 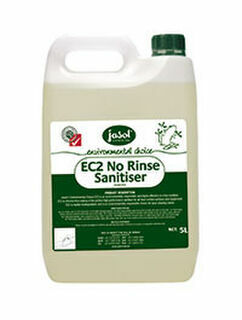 When used as directed this product is an effective sanitiser against Escherichia coli, Escherichia coli 0157:H7, Staphylococcus aureus, Yersinia entercolitica and Listeria monocytogenes. To disinfect pre-cleaned, inanimate, hard nonporous surfaces apply this product with mop, cloth, sponge or hand pump trigger sprayer so as to wet all surfaces throughly. Allow to remain wet for 10 minutes, then remove excess liquid. For heavily soiled areas a pre-cleaning step is required. Prepare a fresh solution for each use. 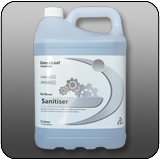 To sanitise precelaned and potable water rinsed non porous and food contact surfaces prepare a 200ppm active quarternary solution by adding 10ml sanitiser to 5Litre water.